The LROC team posted today a new image of the Apollo 17 landing site, captured after Lunar Reconnaissance Orbiter had gotten in to its 50-kilometer mapping orbit, so this is much more detailed than the previous view. Holy cow, you can see where they left the flag! 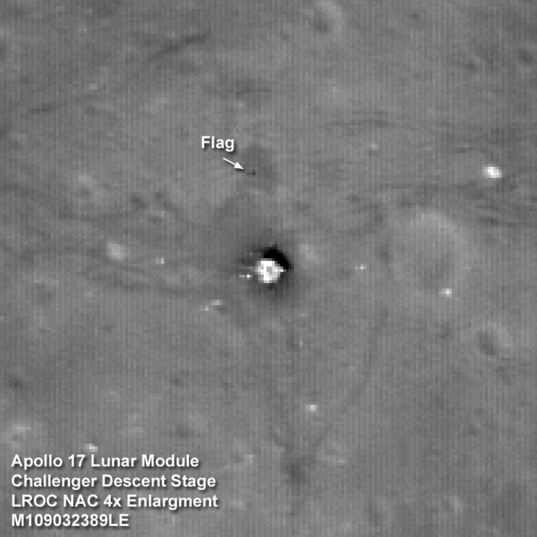 An image of the Apollo 17 lander, Challenger, captured by the Lunar Reconnaissance Orbiter Camera on October 1, 2009, includes not only the lander and astronaut tracks but also a fuzzy dark pixel at the location of the American flag erected there by astronauts Jack Schmitt and Gene Cernan. Visit the LROC website for more of the landing site image and comparisons to photos taken by Schmitt and Cernan.